Whenever I serve this dish the phrase I hear most is “wow, this is nice and light”. I love hearing that because this salad is meant to be uplifting so it is a fantastic spring and summer recipe. Quinoa does not need to be soaked but it should be rinsed or it will have a bitter taste. Rinse the quinoa then place quinoa, water and a pinch of salt in a pot. Cover and bring to boil. Lower heat and maintain a gentle simmer until the quinoa has absorbed all the water, about 15 to 20 minutes. Remove from heat and let cool slightly. In a medium sized bowl, place the vegetables and add the quinoa which should have cooled a bit. 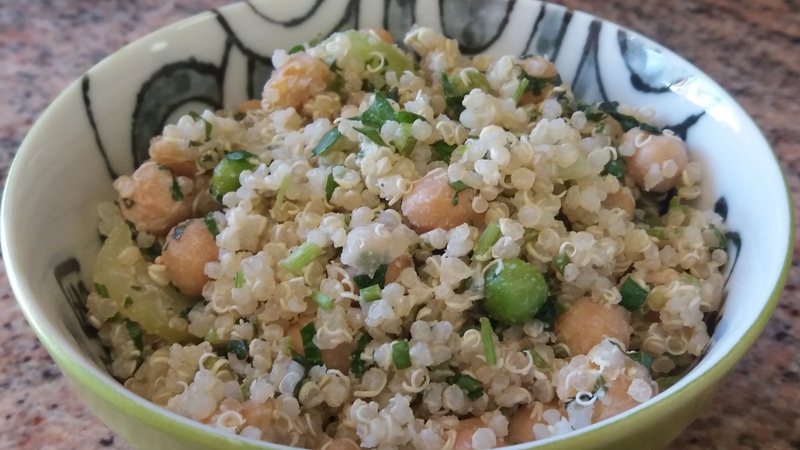 Drizzle the lemon-tahini dressing over the quinoa and vegetables. Toss to combine. Serve.